Taimur Ali Khan is undoubtedly one of the biggest stars of Bollywood at the moment. This little munchkin is winning our hearts ever since he has entered the world and we can’t thank Kareena and Saif enough for bringing this cutie pie to this world. Taimur recently celebrated his first birthday with the entire family in Pataudi and we shared all the amazing pictures from his first birthday with all of you! While we were still trying to get over with his cuteness from the birthday pictures, some more pictures and videos have flooded in from the Kapoor Khandan’s Christmas bash and once again Taimur has taken away our hearts! All the Kapoors were in for a Christmas lunch together and it couldn’t get any bigger. Taimur looked just like our little Santa in a snowman t-shirt and jeans. All the Kapoors were around Taimur playing with him including Ranbir Kapoor, Armaan Jain and Aadar Jain. Taimur was seen enjoying all the attention he was getting and we are totally hearty eyed seeing his cute smiling face. Are you in love with Taimur? 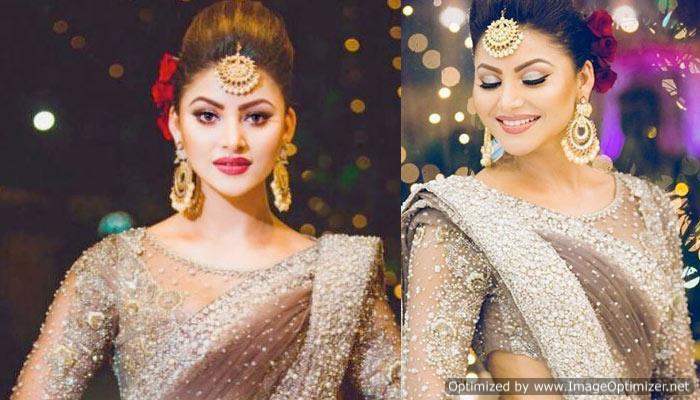 Urvashi Rautela Spends A Whopping One Crore On Her Traditional Attire For Her Cousin’s Wedding!